IT’S NEARLY LAUNCH PARTY TIME! at COPPERDOLLAR STUDIOS, 22 Montague St. Brighton BN2 1JX. Whether you are a puppeteer, maker, actor, teacher, or simply puppet-curious this will be a fun and inclusive afternoon with a chance to have all your questions about the school answered. From 3pm there will be a drop-in MAKE & CAKE session: budding/expert puppeteers are welcome to help us make a flotilla of Brighton Puppetry School boats. Drop in any time after 3pm for cake, conversation and making, and join us for the procession launch finale! This event may feature special puppet guests. 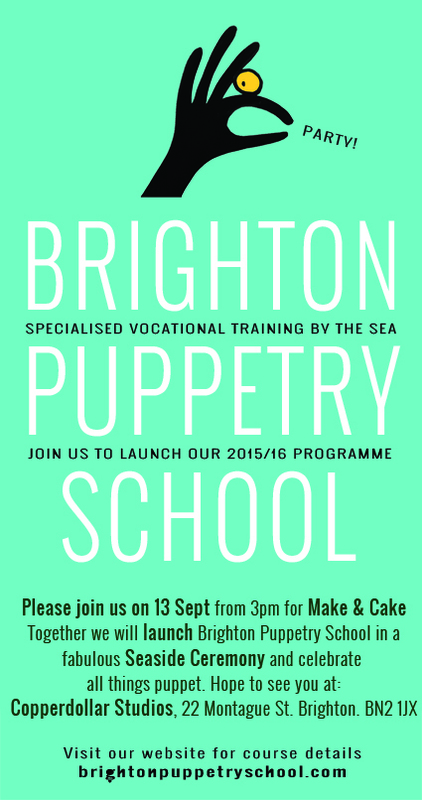 Visit the Brighton Puppetry School website for new course details. Isobel, Darren, Beccy and the BPS team. Excitement is gathering here at Brighton Puppetry School, we hope you will join us to celebrate our official launch with a special party on Sunday 13th September at COPPERDOLLAR STUDIOS, 22 Montague St. Brighton BN2 1JX. From 3pm there will be a drop-in MAKE & CAKE session: budding puppeteers are welcome to help us make a flotilla of Brighton Puppetry School boats. Complete this weekend course to make a puppet especially suitable for the joys and challenges of performing solo. A weekend course introducing the core skills of puppetry. We will explore essentials like breath, impulse, focus, animation, and look at solo and multiple manipulation of puppets. This course will take you through the process of putting together a short solo performance with puppetry. We will explore starting points for generating performance material, and ways to structure your ideas into an exciting and satisfying show. The emphasis of this course will be on objects and light in motion, and open-ended play and discovery rather than making a show. Students will make installations from objects and materials provided and explore the effects of animating them with light upon a screen. A weekend course to make a moving mouth puppet. With one hand operating the puppet’s head and the second as the puppet’s hand this type of puppet is perfect for delivering speech and gesture most effectively.